After Grab bought up Uber’s ride-sharing business, some new businesses have appeared in the ride-hailing app market and are operating vibrantly, promising cutthroat competition in the future. After Uber retreated from Vietnamese market, Grab has ruled the roost in the ride-hailing market. Not long after that several Vietnamese ride-hailing apps continuously made debut. However, only when Go-Viet app appeared, did Grab meet its match. The battle for ride-hailing app supremacy between the two businesses has become increasingly fierce and yet to know the winner. The ride-hailing market in Vietnam recently welcomed a new player – Be - with two first major services: motorbike and car rides. Be run by Vietnamese star-up BeGroup aims to provide services in 15 cities and provinces this year and all 63 cities and provinces nationwide by 2020. The company so far has had 30,000 partner drivers and its app has had more than 3 million downloads. Mr. Tran Thanh Hai, CEO of BeGroup, said that his company’s competition strategy will not aim to offer super low fare rate but to focus on improving service quality and loyalty of partner drivers. Partner drivers of Be will have insurances, receive preferential discount and support for duration of service so that they will provide services professionally and be loyal to the company for a long time. Mr. Hai said that partner drivers are the core value because they are the ones who provide services. Therefore, ride-hailing businesses have to offer the best policy for drivers if they want to succeed. It is necessary to build a professional driver staff and professional services. In addition, the fare pricing policy must be stable which means that the fares will not be increased during peak hours. Similarly, ride-hailing app Aber was developed by a group of Vietnamese youngsters of the 8X and 9X generations based on German technology. In term of services, Aber services are more diverse as it provides up to six different transport services, comprising of Aber Bike, Aber Car, Aber Truck, Aber Travel, Aber Business and Aber Express. According to representatives of ride-hailing businesses, in order to join the battle, they have had to prepare carefully for different features to be suitable with geography and customers’ interests. For instance, there must be different pricing levels for each place. The company has to connect transport vehicles. The drivers must be trained and pass the test to ensure safety for passengers. Most of the aforesaid apps using technology developed by Vietnamese people are in the national start-up program. Thanks to the participation of new players in the ride-hailing market, commuters now have more options when they need to go anywhere. Ms. Kim Nhan shared that she has to use ride-hailing service frequently because of the nature of her work. Earlier, she had no other option than Grab but now there are various options for ride-hailing service. ‘I support the establishment of new vehicle-booking apps for passengers to have more choices when commuting,’ she said. Most passengers said that many new ride-hailing apps offer lower fares than Grab, especially during peak hours. Not only passengers, but drivers also want to have more new ride-hailing apps for them not to be taken advantage of. A partner driver of Grab can be a partner driver of Be, GoViet or Aber and FastGo at the same time. If the booking rate is low, drivers will close the app to open another one. Similarly, passengers usually use some vehicle-booking apps at the same time. When they need to commute, they will use whichever app offering low fare and convenience. More players in the ride-hailing market will create competition in service quality and provide more choices for users, preventing monopoly. According to MA Pham Ngoc Cong, when there are many ride-hailing businesses in the market, there will be fierce competition. They will compete in on-time performance, quality, services and optimal route and at the same time will lower their fares, bringing many benefits for the market and passengers. However, Mr. Cong also expressed concerns about the unbounded development of ride-hailing businesses which possibly creates confusion. He said that relevant authorities need to find measures to manage them effectively. 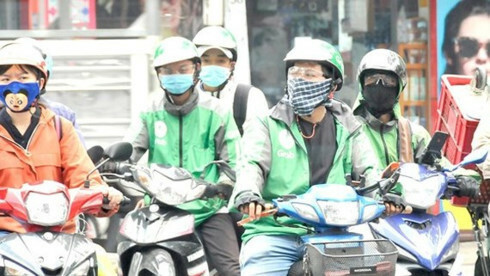 According to Mr. Do Ngoc Hai, head of the Ho Chi Minh City’s Road Transport Administration under the Department of Transport, legal framework for the management of this activity remained unclear as the Ministry of Transport only allowed some companies, including Grab, Mai Linh Car, V-Car and Go-Car to pilot. The rest, including Aber, Go-Viet, Be and Vato, has not given permission to take part in the trial but they are still in operation.